Customers always call and ask me “Why the FLEX XC3401?” and I tell them the same thing every time – it’s simply the best dual action polisher money can buy. Polishing a hood with the FLEX XC3401 and Wolfgang polishing compounds is like roaring down Germany’s famous Autobahn in a Mercedes-Benz CLS63 AMG – it’s surreal, and you simply cannot grasp how smoothly and effortlessly the machine is working. The FLEX XC3401 removes swirls, scratches, water spots and oxidation without even breaking a sweat, similar to how that CLS63 AMG scoots to 60 mph before its driver can even tune in to their favorite radio station. I absolutely love it, and I wouldn’t have it any other way. 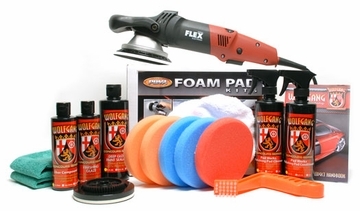 Since I’m such a FLEX fanatic, it was an obvious decision to combine my favorite Lake Country pads with the most versatile pair of polishing compounds from Wolfgang – Uber Compound and Finishing Glaze – in a kit that would complement the smooth, powerful, FLEX XC3401 Dual Action Polisher. Most importantly, this kit had to be reasonably priced, so my team and I worked hard to include everything you need to polish your vehicle to a swirl-free, high-gloss finish without having to take a loan against the kids’ college fund. Simply put, the Wolfgang FLEX XC3401 Ultimate Polishing Kit is the greatest polisher kit I’ve ever assembled. The FLEX XC 3401 VRG Mini Backing Plate is 4 3/8 inches in diameter and allows you to use 5 or 5.5 inch pads with your FLEX XC3401 polisher. The plate is designed specifically for this polisher, and creates the forced rotation that sets the FLEX apart from other dual action buffers. The included 5 1/2 x 7/8 inch Hydro-Tech pads are a perfect match for this backing plate. Total retail value of $633.84. 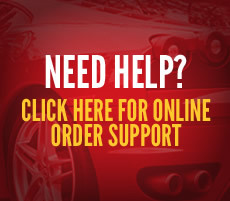 You save $133.85!